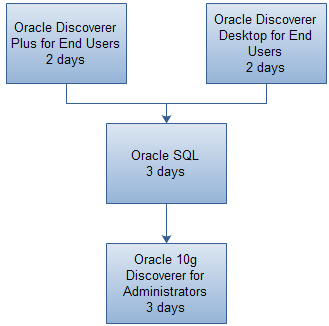 The Oracle Discoverer learning path delivers courses that provide the skills required by end users to query and analyse data using Oracle Discoverer. It also provides courses that teach the skills required by administrators to create and maintain end user layers and business areas, and grant and control user access. Please click on the course titles in the following diagrams to be taken to the course outline. View individual course outlines above to see the relevant dates and locations.